The first season of The Mentalist premiered on September 22, 2008 and concluded on May 18, 2009. It consisted of 23 episodes. When a golf pro's wife and her doctor are murdered in Palm Springs, the California Bureau of Investigation (CBI) is called in to investigate. 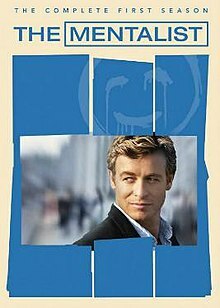 Patrick Jane, a detective and independent consultant for CBI, uses his razor sharp skills of observation to assist a by-the-book Senior Agent Teresa Lisbon and her team (agents Kimball Cho, Wayne Rigsby and rookie member Grace Van Pelt) in finding the killer. The case poses a particular interest for Jane as the killer's calling card (a red smiley face drawn with the victim's blood) suggests it is the famed "Red John": a serial killer who years ago murdered Jane's wife and daughter. However, after further investigation, Jane's mentalist skills tell him the real killer is trying to pin the murders on "Red John" and the team needs to take a closer look at the other suspects including the golf pro, who was having an affair; his brother, who was sleeping with his brother's wife; and the doctor's business partner, who was embezzling money. And while the team may question Jane's tactics, they know working together with him will help lead them to solving the crime. When the dead body of an 18-year-old girl is found in the vineyards of Northern Napa County, the CBI team is called in to find a sexual predator who is using silver duct tape and kidnapping red haired women. After creating a timeline for the victim's disappearance from the restaurant where she worked, the team limits the list of suspects to the people who were at the restaurant that night. Hard evidence points to the victim's drug dealer boyfriend, who came by to pick her up, but Jane's mentalist skills point to the chef. To prove his suspicions, Jane goes behind Lisbon's back and orchestrates an undercover operation with Van Pelt as the bait to lure the killer out of hiding. Rigsby nearly attacks the Sheriff when he starts talking to Van Pelt. But when the operation does not go according to plan, Jane has to get himself out of a jam when he gets caught in a room with not one but two killers: the chef and his wife who have captured another red-haired woman, duct taping and gagging her. Patrick Jane and team plunge into the quintessential California world of surfing when a high school girl's body washes up on a state beach. Ditch water in her lungs suggests she was drowned elsewhere and her body was dumped in the ocean as a cover-up. Since the victim was last seen with her four surfer friends at a beach bonfire, soon to be the site of a condo development, Jane surmises the teens know more than they're willing to admit. And when the condo construction site security guard is found murdered and hidden in a block of cement, with evidence proving he died the same night as the victim, Jane sets a mentalist trap to get the four friends to turn on each other after they try framing someone, and reveal the shocking truth of their collective guilt. The CBI team investigates the murder of a wealthy investment banker, found tortured before being bolted inside his hidden "safe room." At the memorial service, Jane flirts with the widow and gets her to reveal the victim was a man of many secrets. Through further investigation, the team learns he was living a dual life between suburban wife and young mistress, and was also skimming millions from clients and hoarding it away in a secret place. While the team suspects the killer is after the money, their suspicions are confirmed when the victim's daughter is kidnapped in exchange for the hidden money. Jane suspects the wife and mistress so he sets up a mental conundrum, testing their interest in finding the money or child. In the end, the mistress runs to the child and the wife runs to the money. When a bloodstained car connected to two missing girls (Nicole Gilbert and her best friend Kara Palmer) is found abandoned off a local interstate along an isolated lumber town, CBI is called in to help. Upon arrival, Jane locates Kara stabbed to death under the car, but Nicole is nowhere to be found. After searching for her, Nicole turns up at a gas station, covered in blood and holding the murder weapon but has no recollection of what happened. Could she have killed her best friend? Jane, seemingly convinced Nicole is innocent and her memory is just blocked, engineers a situation in which Nicole must relive the terrifying evening. As her memories return and as she helps Jane identify the killer, Lisbon finds herself unintentionally facing him as well, alone. CBI is called into investigate the murder of James Meier, the manager of operations for a resort casino, whose right hand has been found straddling the borderline between California and Nevada. Was this a mob hit or someone trying to send a message? While Lisbon and team look into Meier's business dealings, Jane uses his mentalist skills at the card tables, which make him a genius player, to rake in chips while studying the players on the floor. In the end, Jane discovers Meier's son-in-law's secret life as a degenerate gambler and plays on his gambling obsession to ultimately lure out the truth. The team investigates a hit and run murder of a wealthy California heiress, Rosemary Tennant, whose death was predicted by her psychic, Kristina Frye (Leslie Hope), moments before the accident. Jane, always the skeptic, laughs at the prediction and becomes intent on proving the psychic is a fake and a killer. But when CBI discovers Rosemary's will was being changed, suspicion falls on Rosemary's deviant teenage son, who was being cut out of the will, her younger lover, as well as the ever-present Kristina who was named as a beneficiary in the will. In order to catch the real murderer, Jane uses a gathering of Rosemary's supposed loved ones at a seance, that they think is to expose Kristina as a fraud, but is instead a trap to flush out the killer. When a State's witness in a narcotics case and his girlfriend (Patrice Matigan) are shot in a motel room, CBI is called in on this high-stakes case. Local police suspect the drug dealer on trial is behind the murders since there is no case without the witness, but Jane surmises Patrice was the intended target. Focusing on Patrice, the team discovers she might have been having an affair with a veteran police officer, suggesting she was killed by a cop to cover up the affair. But when the evidence does not add up, the team stages a fake stake-out to ultimately catch the real killer and uncover the tragic truth behind the murders. Jane and the team head to a small farming town to investigate the murder of a National Guard veteran, Rich Garcia, who was killed in an arson fire. After learning Rich's fellow veteran buddy, Dave Martin, was killed in a house fire a few years back, the team goes to question the town's police chief, also a veteran from Rich's unit, only to find his house ablaze. With three out of four members from the unit killed by fire, the CBI digs deeper and learns Dave discovered something more valuable than gold to the drought-stricken farming community – a limitless water supply on land purchased for him by his fellow soldiers. When Dave would not cut them in on the potential profits, his "buddies" set his house on fire. Evidence points to the only surviving soldier, Ben Machado, but when someone tries to set him on fire, the team realizes the killer they're after is not motivated by greed but is instead out to avenge Dave's murder. When a leading scientific researcher at Leyland University, Alex Nelson, drops dead from poisoning, Jane takes a personal interest in the case after learning the lead suspect and victim's ex-wife, Sophie Miller, is Jane's former psychiatrist. Sophie helped Jane through a bad patch following the murder of his wife and daughter and now Jane wants to return the favor. While the evidence starts to stack up against Sophie, Jane focuses on the multi-million dollar behavioral research project Sophie and Alex were working on, and ultimately discovers their research was a sham. With reputations and millions at stake, Jane and the team must find who was willing to kill to keep the fraud covered up. Jared Renfrew (Todd Stashwick), an inmate serving twenty-five to life for murdering his family housekeeper's daughter, contacts Jane about having information on Red John that he will reveal if Jane will prove his innocence. Minelli disapproves of reopening the case, but Jane needs to find out the truth so he quits CBI, and the rest of the team takes a week's suspension to help him. After delving into the Renfrew family affairs, Jane makes a disturbing discovery that Jared's mother committed the murder and framed Jared, after learning he was in love with the housekeeper's daughter and that the girl was her husband's child from an affair. Following the mother's confession, Jared is released, but slips from sight before revealing anything about Red John. When CBI hunts him down in Mexico, they find Red John has gotten to him first, leaving behind only some cryptic words to the information he had. When the dead body of a promising high school football star, Cody Elkins, is found with a pentacle and burning candles next to him, CBI suspects a self-proclaimed real witch is the killer. The witch, Tamzin Dove, confesses to putting a death spell on Cody after he killed her cat but swears she did not hurt him. While Cody's parents believe Tamzin is guilty, hospital records stating Cody put his younger brother, Brad, in the hospital for "rough-housing" and a pentacle in Brad's hideout suggests he killed his brother in retaliation. But when Brad does not fall for a mentalist trap and instead his father does, the true story of family abuse and Cody's murder is revealed. Jane and the CBI team delve into the art world when a fifty million dollar painting is stolen off the office wall of an oil tycoon, A.P. Caid, and his son-in-law is found dead nearby. While it appears the son-in-law, Harry Lashley, was in on the robbery, Jane thinks otherwise and A.P. 's daughter, Stevie, pleads with him to prove her husband is innocent. As the team works to find the real killer and the stolen painting they encounter a variety of suspects including: an art forger who was hired by A.P. to paint a copy of the stolen painting, an art curator with a side-line in helping rich people purchase art, and a criminal Russian oil baron who A.P. outbid to get the painting originally. CBI is called in to investigate the murder of a millionaire's wife, Claire Wolcott, who was shot following a sexual rendezvous with her lover, a local pick-up artist, Paul Fricke. Paul has spent years honing the art of picking up women, creating his own pseudo-mentalist techniques, and using them to seduce women into giving him thousands of dollars. While evidence suggests Claire's controlling husband knew of the affair, giving him motive, the list of suspects grows after CBI interrogates a plethora of local women Paul has scorned. In the end, Cho goes undercover, and with Jane's help, he masterfully employs some of Paul's pick-up techniques to catch the killer—not one of Paul's exes, but someone who has been watching him play women night after night. A country club is rocked when its queen bee, Scarlett Marquesa, is poisoned (with rat poison) at a cocktail party in her home. After interviewing party attendees and the women who served on the club's women's committee board with Scarlett (who was the chairwoman), the CBI discovers that the community itself is full of secrets, such as love affairs and drug abuse. It turns out Scarlett held in-home jewelry parties as a front for the sale of diet pills, tranquilizers, painkillers, etc. Because of the economic downturn, Scarlett was determined to keep up appearances and save her family by any means necessary, which is what ultimately led to her murder. CBI is shaken up when a bomb threat sent to Jane turns out to be more than just a drill, and instead a gruesome murder of a stockbroker, James Medina. In the resulting explosion, Jane loses his sight, and realises that he is the next target. In finding out why, and who might be behind it, Jane and the team must look through his former clients; and confront some of the consequences of his actions. An anonymous campaign against a big corporation begins with the threat of a murder at a specific time and place. Greed and betrayal pits Jane against a passel of alpha male financiers. CBI investigates a series of murders at a corporate retreat in the wilds of the Sierra Nevada foothills. Jane and the CBI team track down a mastermind who hypnotizes people into doing her bidding and ultimately kills them. Jane and the team go to Hollywood when they investigate the murder of a movie producer. Guest stars Rebecca Rigg, Simon Baker's real-life wife. Ed Didrikson, aka Eddie Russo, a member of the mafia turned informant, is found dead by the river with a gunshot wound to the head. Through their investigation even though Eddie was in witness protection, he was dealing pot to teenagers and having an affair with one of the U.S. Marshals. Meanwhile Jane pursues his own investigation on the golf course with Santino Battaglia, a mafia boss, learning about Eddie's past while helping him with his golf game. Jane crafts an intricate plan using an unsuspecting Santino as a threat to get Ed's widow Gina to confess to the murder. CBI is called to an exclusive harbor, Pelican Cove, to investigate the disappearance of Jim Gulbrand, CEO and founder of the software company Gaia Matrix. Jane and Lisbon discover him dead and bound to the anchor of his yacht. The investigation leads them to Jim's girlfriend, Brooke Harper (Lisa Sheridan), a psychiatrist, however they discover that Brooke is a con artist, who was playing Jim for his hidden fortune. Jane uses Brooke as bait to lead them to the hidden money and in the process discovers that Stuart Hansen, Jim Gulbrand's head of security, is responsible for the murder. The team is called to Bright Arch, a wilderness program for troubled youth to investigate the death of one of the students, Justin Prentiss. Using his mentalist skills, Jane uncovers that the boy was buried alive. Jane is able to talk to the students in a less formal setting and finds out that Justin was part of the Z crew, a secret group that gets its name from the story of a mad ax man named Zachariah. Jane stages the resurrection of Zachariah at the school's Sacred Fire, scaring Elliot, the anonymous leader of Z crew, into confessing to Justin's murder. In the first season finale, when the body of Emma Plaskett is found on the only state land within 100 miles CBI is called in to investigate. As Jane notices the victim's toenails are painted with her own blood, one by one the team looks up to see skywriting form Red John's signature smiley face. Emma's twin sister Maya is still missing, and the investigation begins at the Plaskett home. Jane does not think the girls were random targets, but something more personal, while Lisbon thinks this case is a trap that Red John has set for Jane. Rigsby and Cho track the skywriting transaction to a dummy corporation's P.O. Box and find a letter that leads them to the sender, Rosalind Harker (Alicia Witt). Rosalind a blind woman, had a relationship with Red John, and can only give a description of Red John based on her other senses. She does help shed some light on Red John's friend Dumar. Checking out a lead on a farm property linked to Red John, Jane is held at gunpoint by Sheriff Hardy, a.k.a. Dumar. Lisbon rescues Jane but Red John escapes still one step ahead of them. In the aftermath, Sheriff Hardy frees himself from handcuffs and tries to shoot Lisbon but is stopped by a shotgun blast at the hands of Jane. In the UK, the first season aired on FIVE, on Thursdays at 9pm. The series premiered on March 26, 2009 and concluded on August 20, 2009, with a double-bill. Over the 23 episodes, the season averaged 2.84 million viewers, with the pilot being the most watched episode (4.21 million viewers), and "Red Brick and Ivy" being the least watched episode with 2.08 million viewers. All 23 episodes of the season were included on the six disc complete first season set. It was released on September 22, 2009 in Region 1, March 8, 2010 in Region 2, and September 23, 2009 in Region 4. Special features included the featurettes "Evidence of a Hit Series" and "Cracking the Crystal Ball: Mentalist Vs. Psychic". "Cracking the Crystal Ball: Mentalist Vs. Psychic", was produced by Martin Fisher at DG Entertainment for CBS Television. This short film explored the use of psychics in law enforcement by interviewing former FBI, parapsychologist Dr. Barry E. Taff, and psychic detective Jack Rourke. Other cast members include Mark Llewellyn, Karl Sonnenberg, Jon Armstrong. ^ Gorman, Bill (October 7, 2008). "Top CBS Primetime Shows, September 29 – October 5". TV by the Numbers. Retrieved April 3, 2009. ^ Gorman, Bill (October 21, 2008). "Top CBS Primetime Shows, October 13–19". TV by the Numbers. Retrieved April 3, 2009. ^ Seidman, Robert (October 29, 2008). "Top CBS Primetime Shows, October 20–26, 2008". TV by the Numbers. Retrieved April 3, 2009. ^ Seidman, Robert (November 4, 2008). "Top CBS Primetime Shows, October 27 – November 2". TV by the Numbers. Retrieved April 3, 2009. ^ Seidman, Robert (November 18, 2008). "Top CBS Primetime Shows, November 10–16, 2008". TV by the Numbers. Retrieved April 3, 2009. ^ Seidman, Robert (November 25, 2008). "Top CBS Primetime Shows November 17–23, 2008". TV by the Numbers. Retrieved April 3, 2009. ^ Seidman, Robert (December 3, 2008). "Top CBS Primetime Shows, November 24–30, 2008". TV by the Numbers. Retrieved April 3, 2009. ^ Seidman, Robert (December 9, 2008). "Top CBS Primetime Shows, December 1–7, 2008". TV by the Numbers. Retrieved April 3, 2009. ^ Seidman, Robert (December 23, 2008). "Top CBS Primetime Shows, December 15–21". TV by the Numbers. Retrieved April 3, 2009. ^ Seidman, Robert (January 13, 2009). "Top CBS Primetime Show, January 5–11". TV by the Numbers. Retrieved April 3, 2009. ^ a b Seidman, Robert (January 21, 2009). "Top CBS Primetime Shows, January 12–18". TV by the Numbers. Retrieved April 3, 2009. ^ Seidman, Robert (February 18, 2009). "Top CBS Primetime Shows, February 9–15, 2009". TV by the Numbers. Retrieved April 3, 2009. ^ Seidman, Robert (February 24, 2009). "Top CBS Primetime Shows, February 16–22, 2009". TV by the Numbers. Retrieved April 3, 2009. ^ Seidman, Robert (March 24, 2009). "Top CBS Primetime Shows, March 16–22, 2009". TV by the Numbers. Retrieved April 3, 2009. ^ Seidman, Robert (March 31, 2009). "Top CBS Primetime Shows, March 23–29, 2009". TV by the Numbers. Retrieved April 3, 2009. ^ Seidman, Robert (April 7, 2009). "Top CBS Primetime Shows, March 30 – April 5, 2009". TV by the Numbers. Retrieved April 8, 2009. ^ Seidman, Robert (April 14, 2009). "Top CBS Primetime Shows, April 6–12, 2009". TV by the Numbers. Retrieved April 15, 2009. ^ Seidman, Robert (May 6, 2009). "Top CBS Primetime Shows, April 27 – May 3, 2009". TV by the Numbers. Retrieved May 7, 2009. ^ Seidman, Robert (May 12, 2009). "Top CBS Primetime Shows, May 4–10, 2009". TV by the Numbers. Retrieved May 12, 2009. ^ Seidman, Robert (May 19, 2009). "Top CBS Primetime Shows, May 11–17, 2009". TV by the Numbers. Retrieved June 3, 2009. ^ "BARB, scroll to relevant week". BARB. Retrieved May 11, 2010. This page was last edited on 19 February 2019, at 20:37 (UTC).